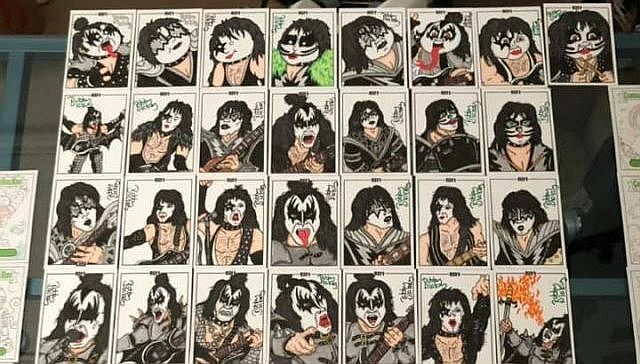 KISS has a long history with both comic books and trading cards. They've had several different comic series on everyone from Marvel to IDW Publishing and Platinum Studios. Different sets of trading cards have been released from the original Donruss set to Press Pass's KISS Ikons collection. Now Dynamite Entertainment has expanded from their different KISS comic book series into the world of specialty trading cards with KISS Deluxe Ultra-Premium Individual Foil Packs and sets. Every individual foil pack includes 2 Base Cards, 2 sketch cards, 1 B&W art card, 1 puzzle card, and 1 autographed card. A Deluxe-Premiere set featuring a select group of KISS's most renowned artists portraying the world-renown rock band in all their glory plus Gene Simmons and Paul Stanley signed cards! This set includes an 18-card base set, PLUS Dynamite chase cards that include: 6 autographed cards, 3 B&W art cards, 9-card puzzle cards, 2-box-topper special cards, and hand drawn original art signed sketch cards. Every autographed card featuring a color ink or ultra-rare, gold ink signature! 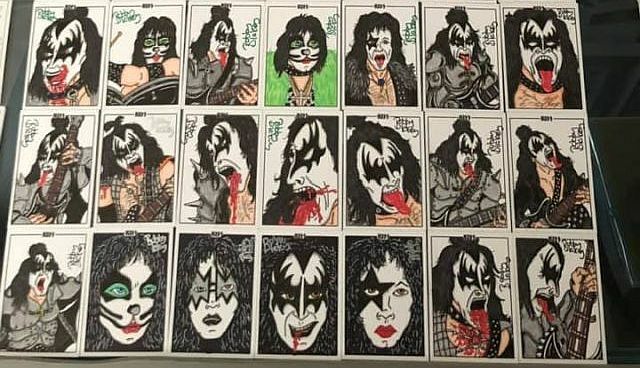 Dallas, TX-based artist Bobby Blakey was one of the lucky folks chosen by Dynamite Entertainment to provide hand drawn art signed sketch cards for the KISS packs. 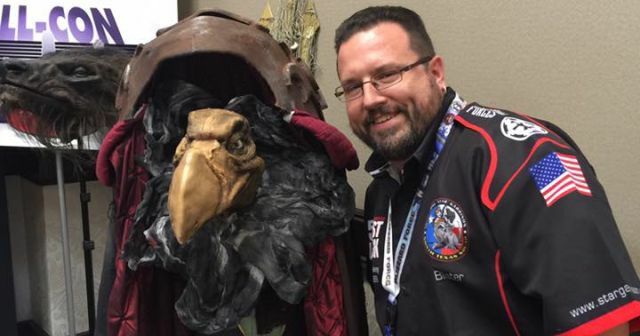 As soon as I found out, I immediately got a hold of him to get the lowdown on the trading card sets. Bobby has actually provided artwork for my MovieGeekFeed.com (check out my header image) and Star Wars website, Revengeofthe5th.com. I've known Bobby for many years and have always liked his artwork and just him as an individual and fellow entertainment writer. Tell us about the process of getting the assignment of doing KISS cards and what are they officially for? I’ve been working on various sets for Topps for a couple of years like Star Wars, Walking Dead, Mars Attacks, Wacky Packs and Garbage Pail Kids. I found out within a group of artists that someone was looking for people to work on a KISS set. I reached out with samples and after a few back and forth emails was offered the gig. I didn’t know going in that it was Dynamite Entertainment, which made the assignment all the more exciting. What did you use as inspiration for the different cards? I used a variety of references including concert photos, artwork and promo stills for inspiration in an attempt to create images that were my own, but also felt familiar to the band's legacy. Were there any specific rules given to you when you were given the assignment? There always are. This set was one of the few where it was pretty minimum. We were told to try and stick mostly to Gene and Paul, but were allowed to draw the whole band. They didn’t really say why, but I just assumed it had to do with the change-up in the band lineup and character likenesses. I believe Paul and Gene (or their people) approve the cards. Which KISS "characters" were you the most excited to work on? 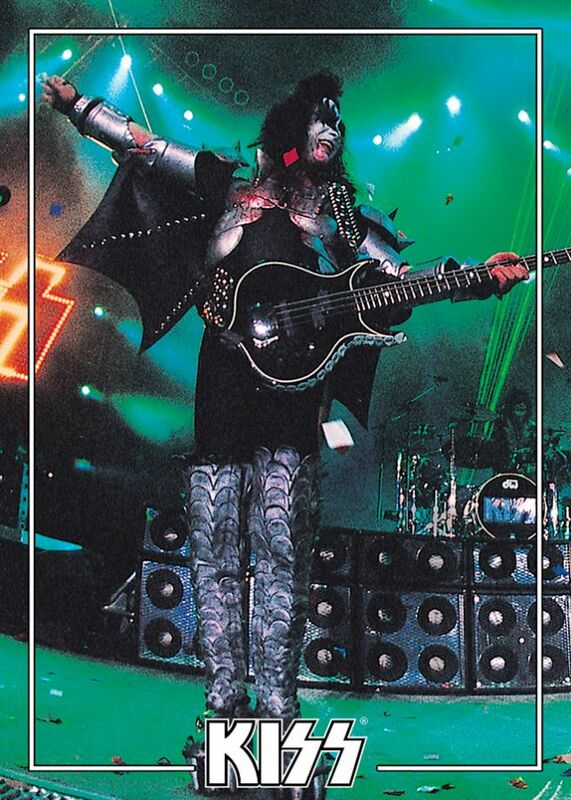 Gene Simmons's Demon. It is such an iconic look for the band, but also one that plays excellent into both the comic and horror worlds. It made for a lot more variety in looks to throw in some fire and blood, which is always fun. I am a cartoonist with a big reference from people like Jim Davis. With the Topps sets over the years, I have shifted a lot into a more comic book style to capture more accurate likenesses. This style worked well for the KISS set as well, but I did throw in some cartoon versions as well. I prefer the cartoon side of it all, but you gotta be able to evolve if you want to work. When can we expect to see these cards hit the stores? I believe they just officially hit stores. What’s funny about this kind of work is that we don’t always know the release date or even which of our cards make the sets. More often than not we find out when everyone else does and which cards based on fan posts and ebay sales. I have been working in the business on the side for about 15 years and full time for the last 2-3 years. Outside of the art world I run the Movie/TV website HollywoodMatrimony.com alongside my wife. We offer up news, reviews, interviews, giveaways and a Facebook LIVE show every Sunday night. In addition, I am a full time martial arts instructor teaching Tae Kwon Do and Muay Thai. I am a full time artist, sometimes I punch people in the face, and other times I draw people doing it. I am currently working on sketch cards for Vampirella, Fallout and Chaos sets for Dynamite, an artist choice set for Viceroy cards, and waiting on a project for Cryptozoic and whatever Topps has coming up next. Outside of the sketch cards, I am also working on issue 4 of my kids comic Keepers of the Dawn as well as a couple of things I can’t talk about yet. You can find out more about Bobby at www.HollywoodMatrimony.com. For more information on where to get KISS cards, go here.